I never thought of using one of these to write! Other than not being distracted by the internet (grrrr), why would you recommend that someone make the switch from laptop to a digital typewriter? I use the alphasmart strictly for drafting. It is a lightweight machine, instant on/off, and with excellent battery options that allow you to write on the go without searching for an outlet. If I need the internet for research, I use my tablet or smartphone, otherwise the internet is turned off. I find when I use my laptop for writing, because I have easy access to facebook, twitter and other distractions, I don’t write as much. I tend to output 1/3 to 1/2 more words when drafting on the Neo Alphasmart. Wow! This is opening up a whole new writing world to me–thank you! 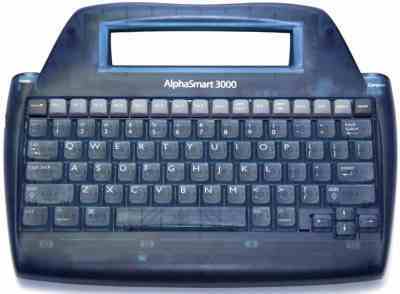 I also started my love of Alphasmart with the 3000 (for $12) a few years ago. It was great, except the keys were clunky. Then I bought the Dana (used) and Neo (new). The Neo was exactly what I was looking for. I’m sad they’re no longer made. I didn’t think I needed it, but ended up getting a Neo2 off eBay and found that I love it even more. The letters are even clearer than the Neo. I wish they kept making them. 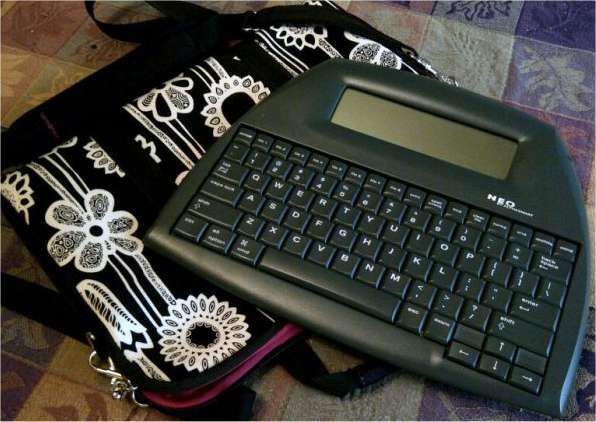 My perfect word processor would be like the Neo2 with WiFi to send to computer/printer and an e-ink screen. I love the Neos so much I bought two of each version for backups. I have not picked up a second Neo, but I have considered doing so. I am not sure how my drafting process would go on without one! Thanks for your story here on the blog. It is good to hear from another Neo fan. This is really interesting Wendy. How do you get your writing from the Neo over to your laptop with no internet? Is there a flashdrive? No flash drive. Alphasmarts are not designed to use them. Instead, you use a common printer cable to “send” your text to your laptop or desktop. The alphasmart types your text into whatever window your cursor is in. You can even use the alphasmart as a spare keyboard. When I am drafting, I am in the habit of sending my text into Scrivner once a day. I preset Scrivner files for my novels even before I start writing. That way the project stays organized. You could write an entire 50k novel in the alphasmart and leave it in there, it would likely be safe, but I am a creature of backups. Thank you so much. I’m trying to decide between the 3000 and the neo2 and this article is exactly what I needed. I’ll go for the Neo2 even though I miss the cool see-through colorful designs of the Turn of the Millenium. The Neo2 is an excellent choice. I use one myself for drafting. 🙂 Have fun! I eschew the data cable and beam my files through the infrared facility. You can even beam them Neo to Neo, etc. Fast, simple, effective. I’ve done the infrared beaming before with one device that still had that capability, but most modern laptops and tablets do not have this feature any more. I understand that there are more patches to use to transfer your data or to use the Neo as a keyboard. Perhaps I’ll do an article on that in the future. Write on! Hello! Do you feel the file size of the Neo or 3000 is limiting? How often, say for the Nanowrimo were you copying the files off? I don’t find the 3K to be limiting at all, but the file sizes are smaller than that of the Neo. When I draft with an alphasmart, I tend to upload my daily words each night onto my desktop. I’m not afraid of the alphasmart failing, more afraid that in the coffeehouse environment there is a chance of someone taking off with the machine! Either the Neo or the 3K will work for Nanowrimo. I won on an 3K my first year without any issue. I simply like the keyboard of the Neo a bit better. That is why I decided to upgrade. Hello there! Hope all is well. I don’t know if you are still checking the comments on here being that this was posted in 2015, but hey can’t hurt to try. Is the Neo still good to use with all the new tech since? Like windows 10? I also noticed many scrivener programs which one would be the one I get. I’m an aspiring writer and I get distarcted on my laptop. I even get distracted with actually writing with pen and paper beyond notes here and there. I begin to doodle and go on a drawing binge. I noticed that when on my memo pad on my phone it is easier for me to keep focused so I looked into devices used solely used for typing and this came up. I found several neos So I am excited to try it if they still work. Hi Avianemelle. Yes, I’m still here and kicking. 🙂 One of the great things about wordpress is that it notifies me of responses on any post on the blog…even one as old as this one. Yes, the Neo is still good to use with current technology. As long as your cursor is placed in a word processing screen (Word, Scrivener, Jotter, you name it) Neo will send your text to that format. What it does is act as a “keyboard” and send the keystrokes to your main computer. It doesn’t matter if the computer is Windows, IOS, or Linux. It just works. I still draft my manuscripts on my trusty Neo and send each chapter into pre-formed files in Scrivener. Then I do my revisions and editing in Scrivener before I send it off to a magazine or format it into an ebook. Neos have come down in price since I wrote this article, you can get one off of ebay for around 20 bucks. Doesn’t matter if it is used. They are built like tanks and stand up to plenty of hard use. Also do you know anything about the quickpad? I would ask around and see if you could find any users of this device before you buy one. Sometimes the programming is so obsolete that it becomes a problem. 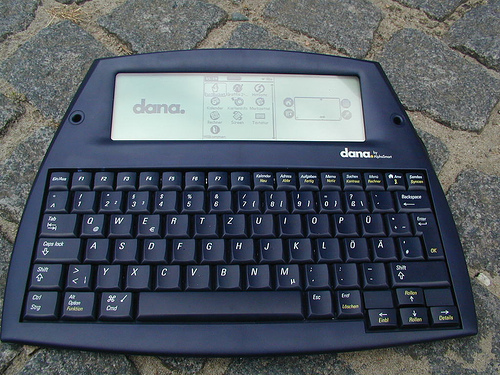 This is the case with the Alphasmart Dana. The wordprocessor in it no longer exisits and you can not get file keys to use the software any more. It renders the machine almost useless. Thankfully, the software for the Neo is still around and available. I Tried the QuickPad but it bled its batteries super fast even when I hardly used it and kept it turned off pretty much the whole time. I gave it brand new batteries too. It may have been just my unit. It seemed like a decent pad otherwise. I also have the Neo2 and the 3000. The 3000 is frustrating to use but I got it just because I’m nostalgic for that Turn of the Millennium style. The Neo2 is the most practical choice. It’s not as cool looking as the 3000 but it gets the job done. I’m glad to have been of help to you. Which one did you decide on?